Also note that occasionally books become unavailable or a new source for out of print books is located. While we will try to provide books out of our inventory and/or can order them from our suppliers, sometimes this may not be possible. We will advise if a situation like this exists when you place your order, or you can contact us and we will verify availability before you order. This landmark work is a practical and historical guide to hand-weaving patterns and dye recipes. It revolutionized l9th-century practices by revealing closely held trade secrets to home weavers and dyers, and giving recipes the home craftsman could use. While not intended for the beginner, this book is a great source of early weaving drafts and authentic dye recipes for craftsmen who know the fundamentals of weaving and dyeing. Of greatest value, perhaps, are the 35 weaving drafts with their instructions. Included are Bird Eyes, Herring Bone, Eight Shaft Coverlet, Diamond Coverlet, Plain Block Carpet, Damask Diaper, Curtain Diaper and more. Then come dye recipes and methods for dyeing cotton and wool, all using natural dyes. Also included are tables and calculations for the size and amount of yarn required for various projects, a description of dye-woods and drugs, recipes for varnishes and stains and more. For this edition Rita J. Adrosko, Curator of the Division of Textiles of the National Museum of History and Technology, has written a helpful introduction containing information on how best to make use of this volume as well as a short glossary of terms. With only a few adaptations to contemporary methods, the modern home weaver and dyer can make great practical use of this valuable book. This unabridged, slightly corrected republication of the first edition, published in 1817 was originally titled The Domestic Manufacturer's Assistant and Family Directory in the Arts of Weaving and Dyeing. As well as the new introduction, a list of Common Names of Chemicals Used in Dyeing has been added. The book contains 45 illustrations and is a fascinating glimpse into the past as well as a great source for historically correct weaving drafts and dye recipes. This book details the history of the craft of brocaded tablet weaving from the sixth to the sixteenth century. It analyses data from the bands, including their metallic and fiber content. It present examples of tablet weaving in literature and art and describes the type of patterns and where they were produced. It lists the many uses for the bands and gives an overview of historical looms and tablets. In addition, the author has graphed numerous historical brocading patterns and offers them for use in band weaving; they can easily be adapted for knitting, embroidery, and other crafts. The book concludes with a catalogue of brocaded tabletwoven bands and an annotated bibliography. If you are interested in tabletwoven bands, the history of handweaving, or are looking for mew patterns to weave and embroider, Ecclesiastical Pomp & Aristocratic Circumstance is a book you must have! Other works by the author include Anna Meuper's Modelbuch - Early Sixteenth-Century Patterns for Weaving Brocaded Bands. CLICK TO SEE OUR TABLET WEAVING CARDS AT A VERY AFFORDABLE PRICE! In style and format, this book closely resembles Davison's Handweaver's Pattern Book, for each draft there's a tie-up, several treadling variations, and each treadling sequence is illustrated with a woven swatch. There's a heavy emphasis on twills followed by some colour weave effects, and then a number of Shadow Weave patterns. Basically this is a pattern book, and there are few words and many patterns. For those looking for an 8 harness pattern book, this one is easy to follow and well done with profuse illustrations. Lots of enjoyment can be had weaving on standard four-shaft looms, but the possibilities - and fun - increase dramatically when you move into the realm of eight, twelve, or more shafts. 8, 12 ... 20 approaches the challenges and pleasures of multishaft weaving with freshness and clarity. 8, 12 ... 20 will take you step by step through designing and understanding weaving structures, and will help you develop confidence in your ability to make fabrics of stunning complexity and beauty. Basic concepts - designing profiles, and twill and unit tie-ups - provide the foundation for exploring unlimited threading and treadling options. Each concept is clearly explained, and fully illustrated with drafts, diagrams, and fabric photos. If you're thinking about a multi-shaft loom, or if you have one and need help in realizing its potential, 8, 12 ...20 will guide you toward practical and creative mastery of complex weaving. There is no need to purchase expensive equipment to find out if spinning is something you would enjoy. A hand-spindle, a comb and some fleece will start you off. This booklet has been written to provide (in an inexpensive form) complete instructions for learning to spin wool with a hand-spindle and later, if you wish, with a spinning wheel. Information is given about fleece and wool, about different preparations of wool and the styles of spinning and types of yarn that con be made. It includes a Chapter on the choice of a spinning wheel as will as explaining the technical details of the mechanism and its adjustment and maintenance. Help is given to produce handspun yarn corresponding in size to various commercial yarns and thus enabling ordinary knitting patterns to be used successfully. Lastly, there is a Glossary and a Chart for identifying spinning faults and their remedies. This book has a great amount of material in its 40 pages that's not easy to find elsewhere. It is well illustrated with line drawings to help explain the techniques described. The author has also written the Encyclopedia of Handspinning, The Essentials of Yarn Design for Handspinners and instructs in the Handspinning - Advanced Techniques video. Mabel Ross needs no introduction to those who already know her popular basic manual The Essentials of Handspinning. In this book she has given the readers another excellently illustrated and clearly written practical handbook for spinners who wish to improve their skills and widen their knowledge of the craft. There is guidance for those who sometimes have difficulty in deciding how to use their yarn and for those who would enjoy being able to plan and spin yarn which is exactly what is required for any knitting or crochet pattern or some weaving project. Described in detail is how to make yarns of many kinds from thick, soft ones to fine gossamer, from simple yarns to the Fancy Fashion ones, expensive to buy but simple to make when you have directions as clear and explicit as those in this book which is full of information to enhance your spinning enjoyment, spurring you on to create and use your own unique yarns. After an initial chapter discussing raw materials, the author provides a section on basic yarn styles covers woollen and worsted yarn. This is followed by chapters on "Initial Fleece Preparation - Yarn and Cloth Finishing", "The Spinning Wheel, "Fibre Preparations and Blending", "Control over Yarn Design in Handspinning", "Practical Aspects of Control of Twist", "Amounts of Suitable Twists for Various Threads", "Spinning Techniques", "Plying Techniques", "Goat and Camel Fibres", "Silk and some Vegetable Fibres" and an "Index of Yarns". Additional tables in the back includea : "Comprehensive List of Sheep Breeds", "Bradford Count, Crimps per inch and Average Fibre diameter", "Summary of British Wool Marketing Board's Grades - Uses of wools", "Required Twists per inch for Given Twist-angle and Thread thickness", "Twist Control for various Spinning Wheels" and "Goat, Camel and Rabbit Fibres' Characteristics and Availability". This handy guide is a must for those who spin and for those who want to learn! The book is extensively illustrated with photographs as well as line drawings showing technique. The author has also written the Encyclopedia of Handspinning, The Essentials of Handspinning and instructs in the Handspinning - Advanced Techniques video. This new book guides you step by step as you make your own drafts for many different kinds of designs. Each chapter is a workshop that you take at home, using your own loom. Not a beginning weaving text, this book assumes you know basic 4-shaft weaving and are interested in using more than 8 shafts. Although most of the examples are for 16 shafts, some are for 12 or 24 shafts, and most of the exercises can be done with 8. The goal is to understand exactly how structures work, through drafts, so you can create the fabrics of your dreams (and a lot of samples). Chapters include straight twills, plaited twills, curves, designing in the liftplan, advancing twills and some network drafting, using a straight draw threading to weave many structures, shadow weave, warp rep, a long chapter on double weave and much more! The drafting exercises are designed for use with graph paper or weaving software. Special instructions are included for table looms, mechanical dobby looms, traditional treadle looms, and computer-assisted looms. This is a thorough introduction to multishaft design, and includes some ideas that will be of interest to more advanced weavers. The book is extensively illustrated in black and white. These weaves in this monograph are developed by dividing 8 shafts into two sets of four; blocks are then designed by arranging groups of threads alternately on the two sets of shafts. Blocks in these drafts vary from 3 to 7 threads. Dr. G. Bateman spent his retirement years weaving sample, first on an inkle loom, then on an eight-harness Missouri table loom. He progressed through Inkle Weaves, Overshot, Twill, Crackle, Summer and Winter and other established techniques to variations on these weaves, and finally to the discovery of new weave systems. The culmination of his work was a manuscript that documents his weaves. This is the 5th volume in a series that reproduces the contents of Dr. Bateman's manuscript documenting his work in weaving samples. These have been reproduced in 6 monographs by the Shuttle-Craft Guild with this volume being Monograph Thirty-Eight. The other 5 volumes of Dr. Bateman's work are titled: Bateman Blend Weaves, Boulevard, Chevron and Combination Weaves, Extended Manifold Twill Weaves, Multiple Tabby Weaves and Park Weaves. In these monographs, Dr. Bateman's text has been printed with no omissions, changes or alterations. His text, which is printed on a gray background, precedes the related text prepared by the editor. The only part of his manuscript that has been rewritten is the wefting directions. The information is the same, but the method of presentation has been changed to a more conventional form of tie-up and treadling. Missing samples were rewoven following Dr. Bateman's directions and using the choice of materials he suggested. The document is illustrated with treadling and tie-up diagrams as well as black and white pictures of the samples. Click Here for a complete list of the monographs in the Shuttle-Craft Guild series. This is the 6th volume in a series that reproduces the contents of Dr. Bateman's manuscript documenting his work in weaving samples. These have been reproduced in 6 monographs by the Shuttle-Craft Guild with this volume being Monograph Thirty-Eight. The other 5 volumes of Dr. Bateman's work are titled: Bateman Blend Weaves, Boulevard, Chevron and Combination Weaves, Extended Divided Twill Weaves, Multiple Tabby Weaves and Park Weaves. The Fabric and Yarn Dyer's Handbook is for anyone who wants to create a unique textile or yarn to use in quilting, home furnishings, embroidery, knitting or crochet. A vital tool for anyone interested in decorating fabric and yarn, this book contains detailed step-by-step instructions to all the main techniques for dyeing and decorating. These include traditional vat and tie-dying as well as innovative contemporary methods never published before involving the use of such workaday items as photocopiers, aluminum foil and latex. Techniques included are: Batik, Stencilling, Block Printing, Screenprinting, Monoprinting, Wax printing, Devore and Colour stripping. A comprehensive section on the characteristics of different fabrics and yarns, dyes, pigments and paints is packed with handy tips from the author, a leading expert in textile dyeing and decoration. Add colour to your life with over 100 recipes for decorating fabric and yarn, from rich jewel-like shades to simple repeat designs of stunning multi-coloured patterns. The main part of the book features the beautifully illustrated recipes that can be made at home. Easy-to-follow recipe style instructions packed with invaluable tips from a fabric-decorating expert. Extensive reference section with step-by-step techniques and advice on choosing fabrics and dyes. Specially designed symbols and colour-coded key provides an instant guide to preparation time, techniques and dyes used, suitable fabrics and level of complexity. The book is a unique design with a hardcover exterior that opens up to easy to turn spiral bound pages inside. The book makes extensive use of colour photography inside to demonstrate techniques as well as show the finished projects. A must for any crafter working with fabric or yarn! Comprehensive in scope and technical detail, Fabric Dyeing and Printing carefully guides you through the choice of fabrics, the vast range of dye recipes, and the profusion of printing techniques, both traditional and new. With patterning options detailed in step-by-step photography, this book enables you to work through more than thirty key techniques, from preparing natural dyes to printing with foils, from hand block printing to screen printing using resist techniques. The works of contemporary designers such as Georgina Von Etzdorf, Timney Fowler, Cressida Bell and Janet Stoyle are highlighted to demonstrate how techniques can be combined and interpreted. This book presents its essential material in three main sections. The first on Preperation shows the reader how to determine the fibres of a fabric, and how to select and prepare appropriate print pastes as well as developing a working design. In addition, all the necessary information for setting up a safe workspace is provided plus information on selecting source dyes and equipment and how to understand common printing terms. The second section focuses on actually using the dyes. The techniques for dyeing fabrics are fully explained, from the initial dyeing of a base colour to methods of pattern dyeing, such as tie-dye and marbling. The author sets out, in easy reference cookbook formula, more than twenty chemical recipes for preparing different dyes (including acid, direct, reactive, disperse and natural). In the third section the book details all the options for both direct printing methods, including handpainting and block- and screen printing, and indirect methods, including mono- and transfer printing. In addition, the book shows the reader how to create fabulous textured fabrics, through the accessible techniques of devore, crepeing and the use of puff pigments. This book is a wonderful burst of colour, extensively illustrated with colour photographs of a beautiful collection of hand dyed fabric as well as step-by-step pictures of the dyeing techniques covered. It is completed by a good Glossary, Suppliers List and Index. Fabrics That Go Bump is the third in a series of Best of Weaver's books: collections of treasured articles from more than ten inspiring years of Weaver's magazine. This volume explores handwoven fabrics with marvelous and unusual textures: waffle weave, honeycomb, pleated fabrics, rib and cord weaves, seersucker and more. This definitive collection of fabrics that go bump includes: comprehensive drafting and designing theory for all weave structures that defy the flat fabric plane, details on fibers and finishing techniques for controlling differential shrinkage for collapse fabrics as well as thirty-five unique projects with complete, easy-to-follow directions. Articles in this book include: "Bumps: An Exploration", "Loom-controlled Trapunto", "Trapunto Drawstring Pouch", "Candy-cane Coat for Tyler or...", "Cord-Weave Kid's Jacket", "Bedford Cord for Kids", "More Bedford Cord", "Juggler's Bags in Bedford Cord", "Honeycomb Pouches", "Honeycomb Carryall", "Honeycomb Evening Top", "Mixing Colors in 3-shaft Honeycomb", "Honeycomb Ribs", "Three for One: Babycapes", "Waffles for Breakfast", "Kitchen Ensemble", "Waffle Family Dishtowels", "Towels in Waffle and Turned Twill", "Playing with Waffle", "Waffle for Blocks and Networking", "Collapse! In Double and Plain Weave", "A Perplexing Plethora of Pleats", "Magic Pleats - From Eight Shafts to Two", "Autumn Leaves Scarf", "Collapse Scarves", "Pointed Furrows", Scarves in Diagonal Pleats", "Fancy Pleated Collar", "3D Double Weave", "Seersucker Softie", "Seersucker Jacket", "Sunset Seersucker", "Poufs Scarf", "Texture with Deflected Double Weave", "Cloque and Deflected Double Weave", "Fulled Merino Scarves", "The Dimensional Scarf" and "Fulled Seersucker Scarves". But it takes knowledge and practice! This book will keep you from starting from scratch in your own pursuit of fantastically textured fabrics. In Fabrics That Go Bump, you'll gain the tools to design and weave textures that are not created by textured yarns but by the innovative use of structure, fiber type, and finishing method. This book is the compilation of work by 33 designers, 35 projects and 15 comprehensive articles from Weaver's and Prairie Wool Companion magazines. This book is extensively illustrated with colour photographs. The other books in the Best of Weaver's series include: Huck Lace, The Magic of Doubleweave, Overshot is Hot!, Summer & Winter Plus, Thick'n Thin and Twill Thrills. Favorite Rag Rugs from the editor of VavMagasinet Scandinavian Weaving Magazine gives detailed weave directions for 45 rugs, from the classic stripe to pattern woven rag rugs in rosepath and half drall. Like the similar book Happy Weaving, with its beautiful and clear illustrations, this is a book that presents an inspiring look into a world of colour and design. There are six sections, each presenting rugs in various techniques. Starting with stripe and check with rugs in simple tabby, progressing to chenille, rag inlay, repp, rosepath, diamond twill and drall - even the names are intriguing. Cutting up worn jeans, old sheeting or a Favorite summer frock has more to it than meets the eye. There are memories there. And before that rug gets woven, dreams have been dreamt. Balls of hand cut or sliced rags lie waiting. Arranging a stripe sequence is like composing some music. What tempo shall these stripes have? Fast, slow, erratic. And how do the fabrics look in the weave? A checked fabric in the "Strand summer" rug produced a lovely effect, the big patterned bedspread in the "Check or stripe rug" made a fascinating moire pattern. More often than not you just can't imagine how things will look before that moment when the weft gets beaten in. Favorite Rag Rugs is intended as an ideas bank of patterns and techniques. From one and the same warp you too, as shown in the book, can create essentially different rugs. Starting with a cotton or linen rug warp, you can throw in rags for traditional, striped rugs or weave a golden rug with a weft of glistening rye straw. A linen warp entered for diamond twill can produce a sturdy rug with an intriguing design. Techniques such as rag inlay and knotted rya bring playfulness and freedom to a weave. Rag inlay, small snippets laid in under a couple of warp ends, could come from fine patterned fabrics or even a bit of lambskin to tickle the feet. Rya knots were bunched into tufty spots on the little bedside rug and an old leather coat was transformed into a round Mocha rya. Infinite potential! All the rugs in this book come with drafts and detailed directions for warp and weft. Suggestions for finishes are also included with each rug. The rest is up to you! Just as warps can be diverse in colour and weft materials varied, one type of finish for a rug might suit the next. Gulvi Heed's rugs feature some beautiful basic finishes and there are directions for making a plied fringe in Stina Larsson's "One cloth - one rug". Go for the finish you think works best. The finish can be what clinches it for the rug. Weaving rag rugs has enthralled weavers for over a century. Once worn and used fabrics were no longer needed in the paper industry, they became the materials that in the majority of homes told the stories of tenderness and care for some of our most personal possessions - our clothes. Some twenty weavers wove and designed the rugs for Favorite Rag Rugs. All of them have great skill, plenty of imagination and enormous love of weaving. Thanks to them, the book has a wealth of varied material and many highly personalized rugs. What could be more wonderful than surrounding yourself with gorgeous handwoven textiles? Weaving them yourself! 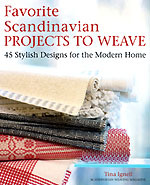 Favorite Scandinavian Projects to Weave features 45 timeless designs specially chosen from the popular Scandinavian weaving magazine Vavmagasinet, and offers all the help and inspiration you need to create a delightful and unique focal point for any room in your home. Behind each one-of-a-kind pattern is an expert designer and weaver to guide you, providing straightforward, step-by-step instruction as well as how-to and troubleshooting tips. Editor Tina Ingnell's superb selection of projects use materials that are easy to find and fun to use, and many can be woven on a loom with four shafts and four treadles. Each pattern is intentionally versatile: choose from a wide array of fabrics to suit your individual style; change the size and colour of blankets, pillows and rugs to compliment a room's decor; or match the colour of table linen to your favorite china. Every taste is sure to be satisfied, as you'll find curtains woven in classic patterns such as huckaback, while "M's" and "O's" are paired with modern panel curtains made with linen and paper. For the table, designs run the gamut from the basic to weavings where you can "let loose" on the loom, including a decorative runner "Flowerbed", "Linen with Little Secrets" containing gold hearts and silver stars, and a tablecloth in block damask with napkins to match. Plus there are hand towels galore, generously sized and in fun patterns; pillows and throws to decorate sofas and beds; and even a comfy hammock to enjoy once the weaving is done. The list of projects includes: "Colorful Throw - Reverse Twill" (6), "Summer Blanket", "Corduroy Fleece Rug", "Hammock and Rug from One Warp" (2), "Roses in Squares", "Rya Checkerboard with Patterned Background", "Diamond Twill Upholstery Fabric", "Soft Cushions in Plattvav", "Straw Table Mat", "Stina's Overshot", "Red Monk Rep Weave Mat" (10), "Red and White Rep Weave Runner", "Hot Pot Piassava" (2), "Rooted in Folk Art" (2), "M's and O's Curtains", "Embroidered Roses", "Pillows with Checks and Stripes", "Arvika Rep Mat", "Linen Summer Hand Towel", "Lime Hand Towel", "Black and White Hand Towels with Color Effects" (8), "Star Hand Towel" (8), "Little Heart Hand Towel" (2), "Waffle Weave Linen Hand Towel" (8), "Square Hand Towels with Hanging Loops at the Center", "Striped Hand Towels", "Striped Throw with Inlay Squares", "Luxurious Mohair Throw", "Linen Summer Pillow", "Warm Blanket - Warm Colours" (8), "Huckaback Curtain", "Huckaback Roll Curtain", "Heart Blanket with Loop Patterning", "Table Cloth in Black Damask" (8), "Mirror Linen Napkins" (8), "Glimmer Placemat", "Linen and Paper Panels" (2), "Inlay Goose-eye with White Rag Rya" (2), "Luxurious Pillow with Linen Strips", "Printed Linen Rugs", "Linen and Paper Festive Runner", "Flowery Wool Mat", "Linen with Little Secrets" (8) and "Flowerbed". All are 4 shaft designs except those marked with the number of shafts in brackets. As an added bonus, Tina Ignell includes a special section on the care and handling of textiles, with guidelines and hints about featured fibers: linen, half-linen, cottolin, wool, paper and plassava. With this book in hand and your own ideas, you are more than ready to create unique fabrics designed to last for generations. A fabulous collection of contemporary, stunning clothes that are wearable art, these one-of-a-kind and limited edition pieces are often kept for a lifetime by collectors - who wear them again and again to experience their beauty and complexity. Setting the garments apart from others are, "the drape of the cloth, the way the cloth moves with the body, attention to fine craftsmanship, line proportion, scale, composition, color, and texture." Designed by 39 of the most creative textile artists in the field, these clothes are unique examples of exquisite form perfectly merged with function. The beautiful works of art-to-wear lavishly illustrated here are extraordinary garments - striking for their colors and textures, as well as their attention to comfort, fit, drape, and fluidity. In association with FIBERARTS magazine, this definitive collection showcases innovative clothing and fabrics, focusing on many of the exciting techniques and approaches used, as well as presenting a fascinating overview of the field. Illuminating the color photographs are the artists' thoughts and personal stories, which you'll find as inspiring as their work. Two essays introduce you to wearable art: the first, by acclaimed art-to wear artist Tim Harding, provides a cultural context and chronology of the movement; and, the second, by well known fiber artist Susan Summa, is written from the perspective of someone who has been passionately engaged in the wearable art movement from its beginnings in the 1960s. Among the 39 featured artists is Ana Lisa Hedstrom, an acknowledged master dyer and colorist. She notes color as the primary impetus in her work and has used the processes of arashi shibori resist-dyeing, overdyeing, airbrushing, and painting to create her designs on fabric, which are assembled into extraordinary, timeless garments. The working method of Anna Carlson might be compared to that of a sculptor. Her thoughts about each piece begin and end with the whole as she envisions the garment in its final three-dimensional form on the body. Anna's working method involves both planning and improvisation, as she responds to relationships between shapes and colors used to compose her work. "Cloth has the ability to transform ideas and the power to seduce the eye and hand," says Jean Williams Cacicedo. I love the fact that you can wear a coat but you can't wear a painting." Every piece begins with a drawing that evolves into a pattern. Jean hand-dyes wool pieces that are large enough to create each part of it. Then she refers back to the drawing and begins sewing the parts of her "puzzle" together. The final design emerges as she works. The complete list of artists represented in this book is: Ana Lisa Hedstrom, Ellen Marsh, Robin McKay, Mike Kane, Steve Sells, Joan McGee, Karen K. Brito, Genevieve Dion, Mark Thomas, Michelle Murray, Carter Smith, Kay Disbrow, maude Andrade, Ellen Gienger, Sally Ryan, Peggotty Christensen, Nick Cave, Michelle Marcuse, Alexis Abrams, Cynthia Wayne Gaffield, Patricia Elmes Farley, Deborah Hird, Mary Jaeger, Cahtherine Bacon, Laurie Schafer, Jane Steinsnyder, Anna Carlson, Hulda Bridgeman, Jane Dunnewold, Tim Harding, Susan Summa, Ann Clarke, Robin L. Bergman, Jorie Johnson, Jean Cacicedo, Carol Lee Shanks, Randall Darwall, Arlene Wohl, Gina D'Ambrosia, Candiss Cole and Patricia Palson. Documenting a vibrant and creative movement in today's culture, these exciting garments will appeal to anyone interested in art, fashion, textiles, or sewing. The book is beautifully illustrated with an extensive collection of full colour photographs and includes profiles of each artist. The authors have taken the simple weaving we all learned as children to make potholders and have turned it into wearable art. The techniques in this book move pin-weaving to a higher level of style. The clear diagrams and instructions make it easy to duplicate the effects and textures shown in the colour photographs. After explaining how to warp the project and identifying the basic terminology, the authors explain several weaving techniques along with weaving variations and a section on Tips & Tricks. A vest pattern is provided along with other project ideas and some notes on finishing complete this book. Illustrated using both colour and black & white photographs as well as many line drawings. This compilation of articles from Fine Woodworking magazine includes a 7 page article with detailed instructions on how to construct a Saxony Spinning Wheel by Bob Kronenberg. There is also an article on turning Lace Bobbins as well as 37 other articles concerned with various aspects of Woodturning. If you need to use a lathe to make a wheel or other items this book will help you understand the tool. When it comes to efficiency, nothing beats the lathe. You can use it to size, shape, smooth and finish a piece of wood all in one operation. And the variety of useful things you can make on a lathe is vas t-- everything from porch pillars to baseball bats. In this collection of 39 articles from Fine Woodworking agazine, some of the past decade's most accomplished and inventive woodturners share their secrets. They show you how to use the turner's gouge and master one of the most difficult of tools, the skew chisel. Tney also offer a wealth of clever shop tips, plans for making tools and gauges, and even advice about achieving the look of turned wood without a lathe. 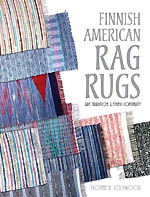 Finnish American Rag Rugs is a study about rag rug culture and the role of rag weaving in Finnish America. In a larger sense, it is also a study of how a craft can persist over centuries, reinforcing the culture, attitudes, behaviors, beliefs, and values of an immigrant group that retains a strong sense of its ethnic identity. Finnish American Rag Rugs provides a history of Finnish immigration to and settlement in Michigan's Upper Peninsula alongside an examination of the tradition of rag weaving in the United States and the Nordic region. Although many other immigrants have a tradition of making rag rugs, Finnish Americans are one of the few groups to have maintained the culture of rag weaving since their immigration. In the process of studying this one activity of one ethnic group, the author uncovers new information about both the history of a ubiquitous form of fiber art and the beliefs and values of an understudied ethnic group. Illustrated with more than 200 color photos, Finnish American Rag Rugs is both informative and beautiful. This is the new revised edition. The right finishing touch can mean as much to a piece of weaving as the right frame for a picture. This book shows how to make and add handles to bags, how to join widths of handwoven materials, how to make and secure decorative fringes, how to warp the end of braids and miter corners, using embroidery techniques as finishing touches, and so on. The ideas and instructions are very clear and complete. We recommend it as a good basic book for your library, one that you will refer to again and again. The author has also written A Cut Above: Couture Clothing for Fibre Artists and Designer Diagonals: Portfolio of Patterns for Bias Clothing. Forgotten Pennsylvania Textiles of the 18th and 19th Centuries explores the weave structure and usage of early tablecloths, towels and coverlets found in and around South Eastern Pennsylvania. Each textile included has a full description and pick count. Weavers will enjoy the clear drawdowns and the large selection of three, four and six shaft designs. A list of institutions where these elusive pieces can be viewed is included, as well as drafts and a bibliography. This book is an important identifying tool for collectors, antique textile dealers and handweavers. This wonderful little book is a guide to Huck Weaving and starts out by exploring the history of the weave. After attempting to determine the origin of the name, the author delves into the characteristics and structure of Huck Weave. A chapter on Threading Theory leads into 12 threading examples followed by a section on Weaving Theory covering information on weaving Weft Spots, Warp Spots, Turned Spots, Double Huck and Triple Huck. Following the background information, the author presents 112 photographed samples of Huck fabric along with weaving instructions. These are grouped into sections titled "All-Over Spots in Single, Double and Triple Huck", "Huck with Plain Weave", "Reed Pattern Huck", "Double-Thread Huck", "Colour Design and Texture in Huck" and "Huck Theory Sample". An extensive list of books, bulletins and leaflets where more information can be found on the subject completes the author's work. For anyone interested in exploring Huck Weave in more detail, this is a great guide to the potential of the weave! The author has also written the book Inkle. This out-of-print book has been updated, revised and renamed as The Ashford Book of Weaving for the Four Shaft Loom. Weaving is a particularly fascinating hobby. From the interweaving of fibres and the combining of the elements of colour, texture and design, comes the satisfaction of producing an imaginative and individual piece of fabric. The four-shaft table loom is one of the most popular of the modern looms developed especially for use in the home. It produces a distinctive, crafted look in fabrics and is sufficiently versatile to appeal to beginner and experienced craftsperson alike. Yet few books have been written specifically for it's use, and the weaver must often struggle to adapt instructions, drafts and techniques to suit the table loom. Anne Field, an experienced teacher of weaving and a craftsperson whose own work is highly regarded, has written this book with special attention to those that have no access to classes, and her clear step-by-step instructions guide the beginner through the weaving process. Contents include yarns, planning the warp, warping the loom, weaving and pattern drafting, and descriptions of the techniques of weaving balanced weaves, twills, weaver-controlled weaves, weft-face weaves, overshot weaves and many more. Nearly 300 illustrations demonstrate aspects of the loom, techniques and pattern drafts and the twenty-five colour plates prove that the end results can be as diverse and interesting as delicate lacy shawls and heavily textured bedspreads. The author has also written Collapse Weave - Creating Three-Dimensional Cloth. This is Monograph Seven produced by the Weavers Guild of Boston, Massachusetts. The author's goal in writing this monograph is to introduce a general method of translating weave structures into knit fabrics, and to illustrate how specific fabrics can be obtained from that method. The weave structures covered in this book are tabby, basket weave, twills, overshot and huck. Eight different translation systems are used: Brocade Knitting, Color-Knit Patterning, Slip Stitch, Woven Stitch, Make-Stitch, Threaded Stitch, Faggoting and Lace. In this book, the reader will find many photographs with directions for knitting the fabrics shown, but this is not a project book; each illustration is just an example of what can be done. Other monographs by the Weavers Guild of Boston include: Josephine Estes' Miniature Overshot Patterns for Hand Weaving, More Linen Heirlooms and Versatile Bronson. In 1832, Franz Xavier Gartner, a weaver from Germany came to America with his wife and eight children. They settled near Stone Arabia, Town of Palatine, New York, where he continued his profession, weaving household linens, blankets, coverlets and rugs for his friends and neighbors. Gartner brought his father's book of patterns with him. The pattern book, most likely drawn from 18th century German weaving books, has patterns arranged from simple to complex. This book is the reproduction of that pattern book. The pattern book appears to have been used as a catalog for his customers who would bring their handspun yarns to him for weaving. A housewife of the 1830's might choose a pattern to be woven in M's and O's using linen for a tablecloth or draperies. Perhaps the handspun and home-dyed indigo wool would be used with white cotton for a summer and winter wool coverlet. Two shades of wool could be woven as a double-faced twill blanket or heavy, coarse wool might be used for a rug. Some of the patterns were suitable for doublecloth coverlets while others were for toweling or church linens. Xavier's notes give a sixteen shaft tie up and instructions for preparing the warp. One type of weaving was unfamiliar to Xavier Gartner but was very popular in the early nineteenth century. This was overshot. His customers must have requested this weave for Gartner drafted some of his three and four block patterns in overshot. The old methods of writing overshot drafts resulted in some technical problems and Xavier's drafts show his lack of understanding of this weave structure. The errors in his drafts have enabled us to identify some existing textiles as his work because the treadling mistakes can be seen in the woven pieces. This book is both a source of drafts and inspiration and a facinating peek into the historical life of a professional handweaver from the 19th century. Weavers of any level will be enriched as this world-famous weaver combines the study and practice of graphic design with the exploration and execution of weaving techniques. The author's intention on writing this book was to explore the possibilities of geometric design from the weaver's and artist's point of view. The weaver and textile artist will find abstract shapes most valuable and, I hope, will gain inspiration, stimulation, and awareness from their transformation into double weaves, pattern weaves, tapestries, rugs and hangings. Part I presents design information and the art and science of classical proportions. Chapter 1 acquaints the reader with basic shapes, their relationships and variations. Chapter 2 explains the manyways in which drawings, cut-out paper and collages can be used for experimentation and as an aid in visualizing the effect the woven textile will present. Various methods suggest creative approaches that can be used to help the weaver select the right technique before final decisions are made. Assemblage of materials and construction of a tactile chart both further sensitivity for the feel and qualities of a great variety of materials and textures. Chapter 3 in this section presents designs selected for their special interest and significance from the standpoint of their historic development and use through the ages, as well as for the beauty and versatility with which they can be applied in many woven interpretations. Meander, Paisley, and the Chilkat blanket are extensively explored within this context. One of the most fascinating aspects of design lies in the arrangement of proportions. Mathematicians and scientists have studied laws of symmetry and proportion in nature for many centuries and have transposed them into formulas that are employed by architects, painters, textile and graphic designers, and many of the most accomplished weavers. Completing Part I, Chapter 4 deals with such systems of design and proportion. Its study can open new vistas for weavers who need to arrange surface divisions for place mats and pillow tops, rugs, tapestries, wall hangings, or clothing. Part II of this book presents a wide variety of weaver-controlled techniques by which geometric designs can be transformed into textiles of interest and beauty. In this section, Chapters 5 and 6 present technical methods of rug and tapestry weaving and show many beautiful examples of ancient and contemporary origin for design inspiration. Chapter 7 concentrates on weaver- controlled methods of laid-in, pick-up, and double weaves and also explores the unusual technique of Karelian Red Pick. The final section, Part III focus on loom-controlled techniques. For the four and multi-harness loom weaver, chapters 8 and 9 offer many loom controlled weaves and patterns. Name drafts, blockweaves, damasks, and supplementary warps are explained with explicit drafts and drawings. Loom-controlled double weaves and three-dimensional structures are presented in great variety in Chapter 10. All chapters include clear photographs, diagrams and weavers drafts with precise explanations and directions. The book is well illustrated with 45 color and 205 black & white photographs as well as 102 diagrams & drafts. The author provides a good Bibliography, Glossary, Index as well as a collection of 10 study problems to allow the weaver to continue their exploration on this subject. The author's other books include: The Art of Weaving and Weaving Source Book. Interest in Indonesian Textiles gained momentum in the United States in the late 1970's. 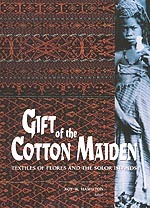 This book documents the weavers and their textiles of the island of Flores and the smaller, neighboring Solor Islands. The full diversity of the textile traditions of this island group in eastern Indonesia is presented for the first time, through the combined work of six textile scholars and anthropologists. The region's magnificent ikat cloths are examined not only for their beauty, but also for their historical and cultural significance as garments, as marriage exchange goods and as items of trade. The lavish illustrations of cloths from public and private collections worldwide are supplemented with rare historical images and the researchers' own photos of textiles in ceremonial use. Unlike works before it, attempts to offer a far broader and more systematic sampling of the textile art of this area and to present it in as full a cultural context as possible. This book is an anthology of articles from a collection of authors who have conducted research in the area. The results have been arranged in three parts, with each part successively narrowing the focus of investigation. Part One, Introduction deals with general themes of culture and textiles throughout Flores and the Solor Islands. In Part Two, Regional Surveys, separate chapters are devoted to each of the islands' five political divisions (regencies or kabupaten). Take together, these five chapters present a systematic survey of the peoples of Flores and their textiles. Part Three, Case Studies, consists of four detailed reports, each the result of the author's prolonged research in a single community. This book is extensively illustrated with 144 black & white pictures and 165 colour plates of the textiles, countryside, tools and weavers in this area. It is a fascinating look into the lives, work and culture of a community of textile artists. There are 8 maps in the book along with Appendices that describe the language diversity and loom construction in the area as well as an extensive Bibliography. Kent McManis and fellow trader Robert Jeffries have provided us with the definitive introduction to one of the most popular American Indian arts -- Navajo rug weaving. The book covers development from the seventeenth century through innovations of the craft today -- everything from the classic Chief's Blankets, to the famous Two Grey Hills designs, to the latest in pictorial rugs. Of great help to the new collector is the list of standards in judging the quality of a rug and advice for its proper care. Fully illustrated with stunning examples of over fifty rug types. Here she shares her expertise as a dyer and her mastery of shibori fabric resist techniques, showing how a huge variety of wonderful effects can be produced byfolding, stitching, binding and clamping fabric before dyeing. Clear instructions and step-by-step pictures demonstrate the dyeing process and show how to prepare, dye and make a silk velvet scarf, a tea cosy, a jacket and a cushion. From the beginner to the experienced dyer, all will be inspired by Vivien's wonderful blue creations. This book is beautifully illustrated with gorgeous full colour photographs of the finished fabric and the steps involved in producing it. An amazing collection of tabular data to aid Fibre Artists in their work. For Weavers information is provided on SETT, Reed and Sectional Warp data as well as standard sizes for household woven articles, information about fibres and drafts and tie-ups. For Knitters, information on Needle sizes, Buttons, Yarn estimation tables, standard Body Measurements, Clothing size cross-reference tables and more. For Dyers, data for calculating colour mixes, chemical common names, Plant Dye colours and Colour Harmonies are included. For Spinners, wool grades, sheep types, and common terminology in spinning and fleece selection as well as much more. An excellent reference companion for those working in Fibres who want an easily accessible source of relevant data without searching through a library of books to find it. To anyone concerned with the design of fabrics, the Structure of the cloth is, of course, of prime importance for achieving best results and most satisfying ultimate appearance, Oelsner's Handbook of Weaves, long the most reliable and comprehensive source of information on the subject will save you hours of research work and offer information necessary for new cloth effects. It covers the field thoroughly from the simple draft and plain weave to the more complicated fancy weaves, with a clear, lucid text and with 1,875 working diagrams. Just a few of the many weaves fully explained, differentiated, and illustrated in this volume are: irregular, double-stitched, and filling satins; basket and rib weaves; steep, undulating, broken, offset, corkscrew, interlocking, herringbone, and fancy twills; honeycomb and lace weaves; tricot and matelasse' weaves; corded, pique', and kersey weaves; and literally hundreds more. The outstanding section on crepe weaves (over 45 pages, 342 weaves) explains 10 different methods, including arranging other weaves, rearranging warp threads, interlocking a weave with its reverse, drafting one weave over another, drafting a weave in four squares, and transposing weaves in checkerboard order. One of the work's most valuable features, particularly to the manufacturer, is the section which shows with text and picture how from a simple swatch of material one may obtain the full details of construction and layout of any fabric made: weave and color patterns, number of threads per square inch, weight of cloth, sizes of warp yarn and filling yarn, etc. A full chapter is given showing how interesting effects may be obtained by arrangement of yarns in contrasting colors in either warp or filling or both, and how effects can be produced by combining weave and color patterns in the same cloth. A large number of examples, with 207 diagrams, show color effects in twills, basket weaves, crepes, etc. Other topics covered here that are rarely found in textile design books are: breaks or recesses in the cloth, weaves that deflect certain threads, broche' fabrics, double transposed textures, reform weaves, the determination of the best weaves, the determination of the best types of weave for specific textures, and many similar topics. These and many other special features add to this unsurpassed collection's immense value for the textile manufacturer, the designer, the stylist, the hand-loorn weaver, the power-loom weaver, and the teacher and student of textiles. It is at once a fully-indexed reference, a lucid "how-to-do-it" book, and a storehouse of unusual information and practical suggestions complete with 1875 illustrations. 2003, Guild of Master Craftsman Publications Ltd. The fine art of rugmaking has never been more popular than it is today. The traditional, utilitarian craft of the past has been transformed by modern designers into an exciting and original art form, taking inspiration from many different fields. This vibrant and colourful book describes all the most popular handcraft techniques in use today, most of which require only a minimum of tools and equipment. The methods covered in detail include: Braiding, Prodding, Tufting, Felting, Hooking, Knitting, Needlepoint, Locker-hooking and Weaving. Sandra Hardy's designs are noted for their subtle and sophisticated use of colour, and many different dyeing techniques are described to enable you to achieve the particular effect you want. There is invaluable guidance on every aspect of the craft, from creating your own designs to applying decorative trims to the edges of the finished work. Full instructions and patterns are given for making six stunning rugs to original designs by the author, each illustrating a different technique. Numerous colour photographs and more than seventy clear diagrams, supplemented by a handy glossary of technical terms, help to take the mystery out of this absorbing craft. Whether you are an accomplished sticher or a complete beginner, this book offers all the help and inspiration you need to create a delightful and unique focal point for any room. This is the Shuttle Craft Guild Monograph 33 and is alternatively titled: An Analysis and Classification of the 55 Most Important Harness Controlled Weaves for the Handloom with Illustrations, Drafts, Tie-Ups, Treadling Orders, Selvage Threadings and Explanations. Written by Harriet Tidball in 1957, this version contains additions by Virginia I. Harvey. The original edition of this book has been a valuable reference tool in my weaving library for many years. In writing the original version in 1957, Mrs. Tidball felt the need for a weave classification system for handloom weavers, finding the available references for powerloom weavers difficult to apply to the handloom. She began with large groupings of weaves with broadly similar characteristics, subdividing them into logical Classes. Each weave class is further organized into Systems according to thread arrangement, sheds and treadling order. The systems are the foundations for patterns, a further classification not in the scope of this book. If a weaver understands the weave systems, she can develop patterns independently. Several improvements have been added to the original manuscript by Virginia Harvey. A paragraph on weave systems vs. weaving methods has been added and clarifies some confusion left in the original version. A chapter on the seven weave systems developed by Dr. William G. Bateman, some of which were classified inaccurately in the original edition, has also been added, making the information more complete. The weaves are organized by the author by grouping them into the following classes: "Plain Weave", "Twill", "Twill Derivative", "Unit", Grouped-Thread", "Double Weave", "Rhythmic Weave", "Gauze or Leno" and the "Bateman Weaves". After explaining the class, each weave structure is shown using a black and white photograph of a sample and is accompanied by a pattern draft and an explanation of the significance and the history. What appears to be on the surface, a good technical reference is designed by the author to provide the reader with an important tool to truly understanding textile construction by viewing it as a "system of interlacement of threads". Click Here for a full list of the Shuttle-Craft Guild Monographs currently available. Considered a classic almost from its day of first publication two decades ago, Handloom Weaving Technology remains the most complete and detailed book in the field. It presents a comprehensive picture of the technology and mechanics of handloom weaving, now updated with a chapter on the use of the computer. This book covers the subject extensively with chapters on: Yarn, The Loom and Shedding Motions, Equipment and Tools, Drafts and Layouts, Preparatory Processes, Weaving, Finishing and Design Mechanics. The author makes extensive use of pictures and drawings to explain the equipment and techniques used in handweaving. Bring a breath of the countryside into your home with a handmade (or even home-grown) basket! You can gather all the materials you need in the woods, in hedgerows and in your own garden - dogwood, willow, clematis, larch and dozens of other plants and trees. All entirely natural and often making use of prunings which would be otherwise wasted. This book shows you, step by step, how to make a range of wonderful baskets alive with the colours of the natural world. Full-colour diagrams and photographs guide you on your way, and the gallery of innovative handmade baskets will inspire you to create something truly original. It's easy! It's fun! Colors appear before your eyes - the colours you want for the projects you have in mind. Dyeing your own yarn or fabric gives you creative control. Taking four types of versatile, easy-to-use synthetic dyes, Hands on Dyeing guides you through the dyeing of natural fibres for use in many textile crafts. Rewarding and simple projects give you practice for both dyeing and using your custom coloured yarns and fabrics. The book begins with a chapter on "Getting Started: Basic Dyeing Techniques" before expanding on the topic with "Controlled Dyeing" and "Choosing the Right Dyestuff". Following this a section on "Color Theory" covers hue, value and intensity and then introduces the Colour Sphere concept. The book then explains "Color Mixing", "Other Application Techniques" including Dip-dyeing, Resist Techniques and Rainbow Dyeing and then explores "Overdyeing for Color Families". This book is extensively with colour photographs of beautiful dyed fabrics as well as a large collection of black and white drawings showing dyeing techiques. The appendices provide a list of common questions and answers, english/metric conversion charts, a list of dye types and their properties, a chart of scientific names for common household chemicals, a list of suppliers a glossary, list of references and an index. This book was written for the weaver, quiltmaker or other fiber artisan who wants the benefit of systematic dyeing but does not have the equipment, time or inclination to do laboratory-style dyeing. The information is designed to give controlled, repeatable, predictable results with a minimum of complexity. The goal of this book is to make dyeing accessable to everyone who wants to employ this simple process for useful and beautiful results. Welcome to the exciting world of weaving with a rigid heddle loom. This type of loom was the authors first introduction to an efficient method of weaving. Before she discovered it, she had tried a variety of simple looms. They were slow and she could weave only relatively short things on them. The rigid heddle loom is efficient, but still simple enough that you can see exactly what's happening as you weave. It is easy and fast to set up and is very portable: you can take it traveling or to workshops. The rigid heddle loom is appealing to beginning weavers, who can get started with a small investment and not find they've outgrown their equipment as soon as they get the hang of it, as well as to experienced weavers who value its thriftiness and versatility. This book starts with tips on buying the right rigid heddle loom and then takes the reader through a first project before discussing such topics as: plain weave, sett, open weaves, surface textures, tapestry, inlay and balanced weaves. Instructions for 11 projects are provided including: a runner or pillow, placemats, a mohair shawl, weft-faced bags, a leno runner, transparency inlay, a tapestry purse, an easy tabard, a red vest, a blue cotton top and a purple afghan. All are shown completed in full page colour photographs which compliment the extensive drawings and black and white photographs showing weaving techniques. The author then gives the readers the tools to plan, design and weave their own project. A good appendix section provides basic reference information with a troubleshooting section, a bibliography, a warping procedures quick check list, and a glossary. In this book, you'll find all you need to know to spin unique, beautiful high-quality yarns for your kniting, weaving, crocheting and other yarn crafts. In addition, you'll acquire a skill that offers pleasure, a sense of accomplishment, and creative satisfaction. With Lee Raven as your guide, you begin with the basics, including understanding the spinning process, building a simple spindle and spinning on a treadle wheel. As you progress you will soon be ready to choose an appropriate wheel, prepare and spin wool, cotton, linen and other fibres. You will also be able to make your handspun yarns into useful and attractive pieces with a set of projects that include "Infinitely Adjustable Hat", "Three-Season Socks", "Plum Shawl", "Rainbow Sweater", "Loopy Mittens", "Weekend Sweater" and "Linen Sweater". This collection of Spinning knowledge includes sections on "Fiber Preperation", "Plying", "Yarn Finishing", "Storing Wool and Yarn", "Fleece Selection and Evaluation" and "Scouring (washing) Wool", making the book an excellent guide for the beginner as well as a great resource for more experienced spinners. There is even a set of instructions on how to turn an old CD (compact disk) into a spindle! Colour and clack & white photos and illustrations showing technique, clear step-by-step instructions, and inspiring pieces you can make yourself will help you spin and use your yarns with confidence and skill. From building a simple frame loom to turning out beautiful one-of-a-kind handwoven heirlooms, Hands on Weaving will get you started on the road to creativity. It includes information on how looms work, from the simple build-it-yourself tapestry frame to full-size floor looms. Clear instructions for a variety of handwoven projects, from very easy to more challenging are provided. Each one is a weaving lesson in itself. In addition, the author covers fundamentals of design, colours and materials for all kinds of woven pieces. Abundant illustrations, inspiring colour photography and lucid text will help you start weaving right away with tools and materials that are readily at hand. This is both an overview and a project book on weaving on three different types of looms  the frame loom, rigid heddle loom and the 4-harness loom. Each loom has its advantages. The frame loom is the simplest, least expensive, loom you can use. The loom does hold threads under tension, but that is all it does. The rigid heddle loom does that but it often allows you to put on a larger warp and does make a shed more easily. The 4-harness loom makes it possible for you to make more complex patterns easier than you can on the other looms. If you have not yet decided which route you ought to follow in your own weaving, this book may help you come to a conclusion. This book is a compilation of articles from over 20 years of Spin-Off magazine primarily focused on the use of the Drop Spindle. This wonderful collection includes articles from such well known authors as Priscilla Gibson-Roberts, Ed Franquemont, Donna Muller and Rita Buchanan. After an introduction by Priscilla Gibson-Roberts, the collection of articles includes: "About Handspindles", "An Ancient Tool Rediscovered", "Hooked Stick", "Instructions for a Quick Spindle", "Spinning on the Go", "Beginning Spinning with Minimal Equipment", "Hand Mechanics for the Handspindle Spinner", "Drop Spindle Basics", "The High-whorl Spindle", "Turkish Spindle", "In Support of Supported Spindles", "Spinning with a Supported Spindle", "Akha Spindle, "Spinning on a Takli Spindle", "Spindles in an Evening", "Making Clay Spindle Whorls", "CD Spindles", "Paper Quills for Spindle Spinning", "Simple Distaffs", "The High-Whorl Lap Spindle", "The Spinners' Story Behind Russia's Renowned Shawls", "Andean Spinning", "Spinning on a Navajo Spindle: A Visit with Sarah Natani", "Spinning with Susie", "Rule of Thumb: NBK* Rolled Brim Hat", "Very Simple Socks", "Family Mittens", "Knitted Merino Scarf" and "A Very Simple Vest". This book is a wonderful collection of knowledge and ideas and a must for both beginning and advanced spinners. In this course the student will learn how to prepare and spin different lengths of fibres to make worsted and woollen yarns for weaving or knitting, using shortdraw and traditional longdraw techniques. The spinner will also learn how to make a plied yarn of any exact thickness with just the right amount of twist, for various purposes, and how to repeat it exactly at any time. Besides yarns of average thickness, very thick, soft knitting yarn and extremely fine gossamer for knitting lace will be spun. As a prerequisite, it is assumed that the student already knows the basics of how to spin a yarn on a spinning wheel. It is not necessary to be a very accomplished spinner before studying the course since the techniques demonstrated assist you to become one. For materials, a spinning wheel with three bobbins and a lazy kate, a metal dog comb and/or flick carder, a pair of handcards and fleesce both long- and short-stapled are required. A detailed list is included in the cassette package. The author has also written the Encyclopedia of Handspinning, The Essentials of Handspinning and The Essentials of Yarn Design for Handspinners. 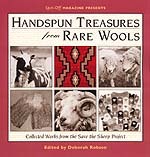 Bringing together the art of spinning and wools from rare breeds of sheep, Handspun Treasures from Rare Wools catalogs the 29 touring pieces from the Save the Sheep Exhibit. It also includes photos and information on endangered breeds, plus photos of several dozen other pieces that illustrate points about the rare-breed fibers and what makes them indispensible for contemporary handspinning. The author begins this book by exploring why some breeds are rare and why this matters to spinners before giving a history of spinning and it's place in people's lives over the years before presenting the exhibition of handspun garments from the exhibit, beautifully photographed in colour. Following this she provides information on a collection of over 20 rare sheep breeds from Cotswold and Karakul to Soay and Wensleydale explaining the history of each along with their fleece and fiber characteristics. The book closes with detailed descriptions of each of the garments in the exhibit and an illustrated set of instructions on processing wool including carding and spinning with a drop spindle. For further research and involvement in this area by the reader, the author provides an excellent list of information sources including books and organizations. This is a wonderful book for anyone wishing to learn more about rare sheep breeds and spinning or who is just looking for inspiration for their next handspun project! This is Shuttle Craft Monograph Thirty-four and covers the basics of weaving . Chapters cover the Loom, Additional Equipment, The Yarns, Thread Requirements, The Draft, The Tie-up, Pattern Arrangement, Dressing the Loom, Weaving, Two-Harness Weaves, Three-Harness Weaves and Twill Weaves. In addition the author discusses: Overshot, Crackle, Summer & Winter, Bronson and Simple Linen Weaves as well as showing how to develop drafts and includes examples for all the Weaves discussed. Subtle Colours, elegant textures and patterns, and first-quality natural silks, cottons, linens, and wools are the hallmark of Sharon Alderman's classic handwoven fabrics. For ten years her seasonal collections of coordinated fashion fabrics have appeared in Handwoven magazine. Now, in A Handweavers Notebook, Alderman shares her design process, tricks of the trade, and specific instructions for more than a hundred of these fabrics. Designing weave structures to suit their intended use, selecting materials, creating colour harmonies that sing, achieving perfect drape and hand - all are explored in detail, along with the personal stories behind each collection. In addition to an amazing number of articles in Handwoven magazine, the author has also written the books: Handwoven, Tailormade and Mastering Weave Structures - Transforming Ideas Into Great Cloth. Note that this is the "real" Handweaver's Pattern Book with the green cover and yellow dust jacket, 1200 weavings and 240 pages that is found in the library of almost every weaver. Another much, much shorter "red" version with only 142 pages and without the numerous corrections and additions that are found in the latest edition (32nd printing) is being sold by a number of vendors that may be a copy of a very early draft of the book that has fallen into the public domain. A modern handbook of four-harness patterns for weavers of all types, whether amateur or professional. Contains three hundred and forty-five threading directions ranging from simple twills to complicated techniques. All are small patterns which may be woven on a sixteen inch warp if so desired, except one chapter of very large patterns. Each design is given many treadlings. These are illustrated with over twelve hundred weavings - all personally made. Directions are set down in a simple diagram. While the number of patterns is extensive, it is not exhaustive. It will serve to stimulate the inventive weaver, but gives a large amount of materials from which the average weaver may draw information than has ever before been presented. Where weavers have been given the impression that a complicated loom was necessary for some types of work, this puts no bounds to the field open to the weaver who uses a table loom, or any other type of four-harness loom. Weavers appreciate the simple diagram in which the directions for duplicating the designs are recorded. It is intended for visual guidance, even to those who do not read English, but sightless weavers are making their own directions in point-writing following this system. The tie-up of the treadles is given in a sequence which follows the threading draft, it facilitates the memorizing of treadlings, without which no speed in weaving can be accomplished. A valuable aid to teachers, occupational therapists, interior decorators, commercial weavers, as well as home weavers. Also note that we sometimes have pre-owned copies of this book available for $39.95 CDN ($34.95 US). Contact us for current availability. The book is divided into five sections for clarity: straight draft, point draft, block weaves, lace weaves, and specialized techniques. Individual samples are shown actual size or bigger from the front view, with a detail showing the reverse view where this is of particular interest. For purposes of comparison and pattern clarity, for each two-page unit of samples, the same color thread is often used for warp or weft. Extended samples (gamps) use different threading drafts and thread color combinations to increase the range of options available to the weaver. This ideal companion to A Handweaver's Pattern Book has been condensed from the original 240 pages into a paper back book of 128 pages, selecting the patterns which give a broad scope of design. Printed on ivory paper, the book has a sewn binding for durability. Every draft has been made into a graph or picture showing its appearance when woven. These beautiful drawings are the work of Charles Denzler, who prepared the illustrations of A Handweaver's Pattern Book. Full directions are given for reading the drafts, which are written in a clear manner after the syatem used by many early weavers. Since 1975, Handweavers around the world have been celebrating the time-honored craft of weaving through the colorful pages of Handwoven. Filled with beautifully photographed projects for the four- to eight-shaft loom with step-by-step instructions, Handwoven also includes thoughtful articles on designing with color and yarn, planning projects, and finishing pieces. Regular features on weaving in other cultures and times, profiles of weavers, tips and techniques to make weaving easier, product information, book reviews, and a calendar of events keep alive the fascination of creating cloth and inspire us to take shuttle in hand and weave. Published five times a year in September, November, January, March, and May, Handwoven is a magazine you'll read from cover to cover and refer to often in the years to come. We have a large selection of New Copies of the magazine covering the last 12 years. We also sometimes come across collections of Used Magazines which are available on a first-come basis. The Handwoven Magazine Index is also available. This book provides an in-depth analysis of felted handwoven clothing. Starting with a history of felted cloth the author describes the different types before providing an overview of garment design and a detailed explanation of the Felting technique. She then provides a portfolio of Felted designs along with instructions on how to construct each. These designs include the: "Canopy" purple coat, "Celestial" kimono, "Reflections" mirror vest, "Night Rainbow" knit sleeve jacket, "Red Sky at Night" fleece coat, "Sweetie Pie II" fleece vest, "Midnight Blue" modular sweater, "Winter Celebration" capote coat, "Storm Top" modular top, "Apricot Sky" jacket and the "Summer Sky" blue vest and sweater. The book also includes chapters on "Edge Treatment" and "Surface Embellishment" to help the reader complete the designs as well as a chart with information on fulling wool a bibliography and full index. The book is well illustrated with colour photographs of the designs being modeled as well as many line drawings of technique and garment design. The editors of Handwoven magazine have gone back through the almost three decades of the magazine and have compiled these wonderful collections of weaving projects. Each design collection focuses on a different theme and includes 10 to 30 unique projects. While some are now out of print, many of the Handwoven Design Collections are still available. They are a great source for a design for your next weaving project or as inspiration for your own original design! This course answers your questions about what weaving is, as Madelyn clarifies and classifies weave structures and patterns. Have you often wondered about the difference? Graphed drawdowns, cross sections, and woven samples illustrate the descriptions and provide a thorough overview and clear description of weave structure and pattern and how to inter-relate with one another in the woven cloth. Beginning weavers can listen and learn and listen again. Teachers, advanced weavers and students of textile history will find this a useful introduction to textile construction. This wonderful guide provides a master index for 21 years of Handwoven magazine (from 1979 to 2000) allowing you to quickly find articles on any subject. Whether you are searching for "Inkle Loom Projects", an article on "Silk" or want to learn more on "Double-Faced Weaves", this guide will save you hours of searching time and will turn your collection of Handwoven magazines into a gold mine. In addition, an "Author Index" lists each person who contributed articles to the magazine over the years along with the titles and issue they appeared in to allow you to find articles by those writers you liked. A list of suppliers and resources completes this invaluable tool. The only book devoted to this family of weave structures! Traditionally, lace weaves have been used for fine linens, and most recently in the fashion and art fabric worlds. While "true" laces are laboriously made with needles or bobbins, the handweaver can use a loom to quickly produce lovely, lacy fabrics. The simplest weaves produce overall patterns. With the more complicated varieties, a weaver can design figures, initials, and geometric patterns into the cloth. Handwoven Laces has explicit instructions for identifying and understanding the various lace structures and in-depth chapters that explain how to use traditional patterns and create original ones. Beginning with the most basic interlacements, master weaver Donna Muller shows you how to develop lace structures in creative, logical ways. She begins with the most basic of lacy effects, and shows how other structures can be discovered through progressive, minor changes in threading and treadling. Woven samples, drafts and diagrams clearly illustrate the principles behind the lace weaves. Suitable for self-study or class use, this book offers both new and experienced weavers a sense of mastery and a wealth of new ideas. This monograph covers the techniques used to construct rugs. The Plain Weave approaches covered are: Rugs constructed out of of Rag Strips, Twice-woven Rugs, Swedish "Matta" Technique, Picked-up Tufting, Rugs with Knotted Pile, Soumak and Tapestry Techniques. In the category of Four-Harness Overshot Weaves; American Colonial, Indian saddle-blanket weaves and the "no tabby" technique are covered. In addition to these the author discusses Crackle Weave, Summer and Winter Weave and Two-Warp weave techniques with four-harness, eight-harness and the pick-up method. The mongraph is illustrated with the author's own notes and drawdown information and concludes with a small section showing various fringe-ties for finishing the rugs. Scarves in many shapes and sizes, imaginative colour schemes, unusual fibre combinations, and striking weave structures. Scarves small and large, subtle and bold, fuzzy and smooth. From looms across the country and across the world comes this collection of fifty exquisite handwoven creations. Selected by the craft editors at Interweave Press, each scarf is portrayed in full-page, full-colour photography and is accompanied by design notes and a brief biography of the weaver. Whether you're a beginning weaver or a seasoned artisan, you'll find a volume of inspiration in Handwoven Scarves with projects with titles like: "Northern Lights Silk Scarf", "Dyed Block Twill Scarf", "Black Supplementary Warp Scarf", "Navy Supplementary Warp Scarf", "Thick, Thinner, Thinnest", "Two-Layered Scarf with Shifted Layers", "Natural and Terra Cotta", "Drawloom Damask Scarf", "Damask Ribbons", "Big Scarf", "Pleated Scarf", "Smooth Scarf", "Rippling Water", "Silk Cashmere Scarf", "Wool Gauze Scarf/Shawl", "Overshot Scarf", "Hummingbird Scarf", "Blue and Yellow Stripes with Beads", "See-through Blue", "Red Pleats", "Squares", "Indigo Ikat Scarf", "White Huck Lace Scarf", "Painted Warp Scarf" (three versions), "Painted Cotton Warp Scarf", "Gray Chenille", "Blue Chenille", "Hot Pink Chenille", "Golden Damask Scarves", "Block Twill Scarf", "Cram and Space Scarf", "Ripplemarks", "Twill Scarf", "Two-Layered Scarf", "Black, White and Red Scarf", "Silk Scarf", "Sunset Blocks", "Stripes", "Gray Stripes", "Boulevard Weave Scarf", "Pleated Colors", "Pastel Stripes", "Twill Stars", "Indigo Fancy Point Twill Scarf" "Angora and Silk Scarf", "Southern Lights", "Huck Lace Ogee Scarf", "Large Plaid", "Checkerboard Scarves" and "Wrap Around". The first issue of VavMagasinet was published in 1982, and while the magazine established itself primarily within the Scandinavian countries during it's first intensive years, VavMagasinet also found a large audience in the USA, Canada, Holland, Germany, Switzerland and Japan. Today it is translated into four non-Scandinavian languages and has subscribers in 35 countries. In addition to its regular articles and commentary about textile art and weaving, every issue includes approximately ten weaving projects created especially for the magazine with comprehensive weaving descriptions. Many early copies of the magazine are now out of print and in this book, the editors have assembled a collection of 42 of the most popular weaves grouped by category. The categories and projects include: Tablecloths and Runners - "Paraphrase", "Remnants Check", "Little Tablecloth in Huckaback", "Torpa", "Linus", "The Rose Wreath", "Happy New Year", "Colour and Line Play" and "Gold Star"; Handtowels - "Handtowels in Balance Twill", "Stripes and Checks" and "Handtowels Made of Linen"; Furnishing Fabrics - "Time for Children's TV", "The Sofa Re-covers" and "Red and Gold"; Curtains - "Grid Curtain", "Mosquito Net Weave", "Old-style Net Curtain" and "Aunt Elin"; Cushions - "Rosepath", "Halvdrall", "Cushions Woven on Painted Warp" and "Line Play"; Plaids - "Baltic Sea", Autumn Glow" and "Damask Plaid"; Rugs - "Rosepath Rug", "Traces", "Multicoloured Rug in Double-Faced Weave", "The Serpentine", "Rug Ranserod" and "Finn - Rug Woven in Jute Yarn"; Garment Fabric and Shawls; "Stardust", "Beautiful Stoles with Exquisite Patterns", "Two Soft Scarves", "Silk Scarf", "Poncho in Silk and Wool", "A Man with Style" and "Classic Cape"; and Christmas Weaves - "Christmas Runner and Placemat in Tabby", "Christmas Tablecloth in Cottolin" and "Repp for Christmas". All designs are shown in full colour pictures and include complete instructions including the tie-up and treadling draft. A majority of these designs (29 patterns) can be woven with a 4 shaft loom while there are 7 patterns that require 5-8 shafts, 2 that require a 10 shaft, 1 that requires 21 shafts and 3 for a drawloom. As well as the designs, there are a couple of general articles on finishing and washing handwoven projects. Lillemor Johansson, one of the editors of this book has also written Damask & Opphamta: With Weaving Sword or Drawloom, co-edited Swedish Rag Rugs - 35 New Designs and was the long time editor of VavMagasinet, the Scandinavian Weaving Magazine. The textile artist Helena Hernmarck was born and educated in Sweden, but since 1975 has lived and worked in the United States, where she has had a distinguished career. In the freely experimental world of American textile art, she is unique in upholding and expanding on her Swedish textile heritage: traditional weaving techniques and narrative images. Her m�tier, too, is unique - large tapestries for public spaces, often produced in cooperation with renowned architects such as I. M. Pei and Philip Johnson. She debuted in Sweden with abstract pieces done in free rosepath - a new approach to an old weaving technique. In the late sixties, living in Canada and drawing inspiration from pop art, she began to evolve a photorealist style, working from photographs and newspaper images. Her first one-woman show came in 1973, at the Museum of Modern Art in New York. Many more would follow, both in the USA and Europe. Her monumental works grace buildings from coast to coast and around the world. In the nineties, while continuing to carry out her major commissions, she has returned to a more intimate scale, working from her own watercolours and collages of letters and paper. In 1999, Helena Hernmarck is exhibiting work from her 30 years as a textile artist, first at the Fashion Institute of Technology in New York and later at Prince Eugen's Waldemarsudde in Stockholm, Sweden. This book profiles the inspiring career of one of North America's foremost tapestry weaver and highlights her work in a collection of beautiful colour photographs. Insight into the designs and techniques is provided. This book is a must for the tapestry weaver or any fiber artist that is looking for a source of inspiration. High Whorling is an inviting book for the new spinner, covering all aspects of spinning with the high whorl handspindle from fiber selection and preperation to detailed spinning technique. It is also the ideal guide for those with previous experience in low whorl or wheel spinning who wish to take up the high whorl. Spinners at all levels will want to study Priscilla A. Gibson-Roberts in her (sometimes surprising) approach to fiber and spinning technique, her choice of hand tools, and her own carefully worked out methods of yarn finish. Other books by this author include: Ethnic Socks & Stockings, , Knitting in the Old Way and Simple Socks, Plain and Fancy. This book is for someone who would like the experience of owning, or being owned by, an antique spinning machine. It is not about how to spin, there are plenty of good books on this, and it is not a manual on how to do major repairs and restorations - if you know enough to undertake these you don't need my advice. It is an introduction to one of life's great tactile pleasures, the experience of being one with a remote ancestress, and turning out beautiful yarn the way it was done 150 years and more ago. In this wonderful little book, the author provides both a historical and technical understanding of the spinning wheel with chapters on "A Brief History of Spinning", "Spinning Machines", "Caveat Emptor", "Old or Very Old", "Identifying Spindle Wheels", "Identifying Flyer Wheels", "Repair and Restoration", "Making Your Wheel Work", "Accessories", "Spinning in Company", and a "World Tour". It is packed full with pictures of old spinning wheels and spinners and is a fascinating journey into this obsession. Note that this is the expanded 2nd Edition of the book with 24 pages more than the 2001 first edition. How to Make Your Own Hammock! Note that the price includes a coupon for $10 off on the future purchase of a hammock kit. Follow the link to find the price of the kit with the book included. As the name suggests, this guide provides instructions on weaving a hammock (click here for a picture of the finished design). A full written explanation of each of the steps involved in the process is complemented by a set of detailed pictures showing the particular knot used at each phase. While any 5/16" rope can be used, Camilla Valley Farm sells kits of a special soft but durable braided polyester cord specially designed for Hammock making in Forest Green or a Light Beige colour. These kits also include the steel rings for each end. click here for ordering information for these kits as well as completed hammocks ready for use which are also available. The guide details the tools and materials required to construct an extra large hammock with 5 foot by 7 foot bed and an overall length of 13 feet. The kits do not include the two wooden stretchers at each end (basically 2 x 5 foot long 1" x 2" wooden pieces with 22 holes drilled through each) which can be made fairly easily by someone familiar with basic woodworking using the books description. The stretchers also provide a way for the maker to customize their hammock design with their choice of wood, finish or colour. A rudimentary shuttle for threading the cord must also be constructed out of scrap 1/4 to 1/3" plywood and a pattern for this is included in the book. This book and a hammock kit are the perfect gift for the do-it-yourselfer who takes pride in making items for himself/herself or as presents for friends. This guide simplifies what appears to be a complex arrangement of ropes into a simple set of steps and results in the production of an impressive professional looking design. Huck Lace is the first in a series of Best of Weaver's books: collections of treasured articles from more than ten inspiring years of Weaver's Magazine. More than forty projects by Weaver's talented designers give complete instructions for weaving huck lace fabrics for towels, table linens, shawls, scarves, throws, clothing and more. For the weaver who enjoys creating original designs, find here the easiest and most comprehensive method for designing huck in print today. This definitive work on huck lace also includes: block design, network drafting and pick-up with huck lace as well as combining huck with other structures and special fibre and finishing tips. The articles are broken into four sections starting with "huck basics" which includes "stuck on huck", "the way huck works", "a huck pattern book", "another look at drafting huck", "huck lace as a unit weave" and "a designer's handbook for huck". A "projects" section then follows with "linen dishtowels", "huck lace drapery", "lace is for christening gowns", "a huck family album", "alpaca shawl", "huck lace scarves", "framed lace", "a wedding dress", "huck lace napkins", "networking by snail mail", "huck lace butterflies", "network drafting with huck lace", "Lillian's secret" and "lace placemat". Next the "pick-up" section includes "a pick-up handbook for lace weaves", "pick-up huck: three projects" and "muck". In the final "huck plus" section articles titled "lace and honeycomb mats", "diversified what? ", "a closer look at Swedish lace", "what is color-and-weave? ", "seersucker and lace", "huck-and-plain double weave" and "Santa cloth" complete the work. By bringing together the work of 35 designers, 43 projects, 15 comprehensive articles from 11 years of Weaver's magazine, the editor has produced a marvelous guide to this subject. This book is extensively illustrated using colour photographs. The other books in the Best of Weaver's series include: Fabrics That Go Bump, The Magic of Doubleweave, Overshot is Hot!, Summer & Winter Plus, Thick'n Thin and Twill Thrills. This publication is a transcription of a huck collection purchased with funds donated by the members of the Weavers' Guild of Boston in the Spring of 1995. The collection consists of 31 folders with approximately 350 woven samples for 4 to 10 harness looms. Most samples were woven with white 20/2 cotton set at 30 epi. There are some samples woven with coloured pattern warp. The collection was owned by Jeanetta Jones of Westfield, Massachusetts, who had, in turn, purchased it from Amorette Claris. Magazines and newsletter credits given on some folders suggest and early 1960's weaving time. The samples were woven during or for workshops given by Gail Redfield.